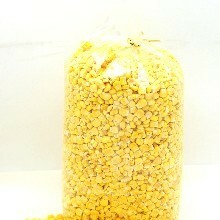 Our super-sweet corn is picked and then freeze-dried at the peak of its sweetness. It is so sweet, that you might think it was sweetened with sugar, but the only ingredient is corn. Best way to describe it? Imagine the appearance of kernels of yellow corn, with the texture and fluffiness of popcorn-without the crunchy kernel. This super sweet corn is a great salad topper, substitute for croutons for an interesting change. It's delicious in soups, pancakes, cornbread or muffins. Mix into popcorn or trail mix for a fat-free sweetener.Packaged in a 19 oz. bag.